University of Missouri, 9780826219862, 256pp. Only 50 percent of kids growing up in poverty will earn a high school diploma. Just one in ten will graduate college. Compelled by these troubling statistics, Heather Kirn Lanier joined Teach For America (TFA), a program that thrusts eager but inexperienced college graduates into America’s most impoverished areas to teach, asking them to do whatever is necessary to catch their disadvantaged kids up to the rest of the nation. With little more than a five-week teacher boot camp and the knowledge that David Simon referred to her future school as “The Terrordome,” the altruistic and naïve Lanier devoted herself to attaining the program’s goals but met obstacles on all fronts. The building itself was in such poor condition that tiles fell from the ceiling at random. Kids from the halls barged into classes all day, disrupting even the most carefully planned educational activities. In the middle of one lesson, a wandering student lit her classroom door on fire. Some colleagues, instantly suspicious of TFA’s intentions, withheld their help and supplies. (“They think you’re trying to ‘save’ the children,” one teacher said.) And although high school students can be by definition resistant, in west Baltimore they threw eggs, slashed tires, and threatened teachers’ lives. Within weeks, Lanier realized that the task she was charged with—achieving quantifiable gains in her students’ learning—would require something close to a miracle. 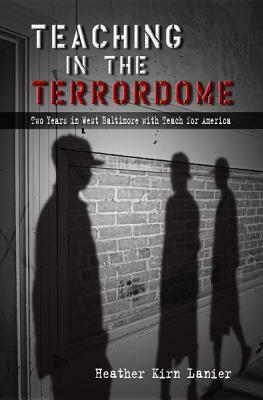 Superbly written and timely, Teaching in the Terrordome casts an unflinching gaze on one of America’s “dropout factory” high schools. Though Teach For America often touts its most successful teacher stories, in this powerful memoir Lanier illuminates a more common experience of “Teaching For America” with thoughtful complexity, a poet’s eye, and an engaging voice. As hard as Lanier worked to become a competent teacher, she found that in “The Terrordome,” idealism wasn’t enough. To persevere, she had to rely on grit, humility, a little comedy, and a willingness to look failure in the face. As she adjusted to a chaotic school administration, crumbling facilities, burned-out colleagues, and students who perceived their school for the failure it was, she gained perspective on the true state of the crisis TFA sets out to solve. Ultimately, she discovered that contrary to her intentions, survival in the so-called Charm City was a high expectation. Heather Kirn Lanier is Visiting Assistant Professor of English at Miami University in Hamilton, Ohio. She is the author of The Story You Tell Yourself.